Below is a 5-question test on the diameter. This test is linked to the lesson on the diameter, which also has a test. What is a diameter? What is a circle? What is a radius? 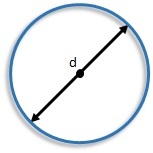 A diameter is the line through the center of the circle that has its endpoints on the circle. The diameter also refers to the length of this line. The diameter is often denoted by d.